Wait, what? There’s more than one Bitcoin? As if getting a handle on cryptocurrencies wasn’t hard enough, we’re now entering the days of multiple Bitcoin currencies. I guess you could compare it to dollars: there’s both the US dollar and the Canadian dollar, and they clearly have quite different geographical uses. But as you can probably imagine, things are slightly more blurred when it comes to the blockchain. Bitcoin Cash is one of the most famous altcoins. It walks the wobbly line between fading into myriad other altcoins and grasping the fame and fortune of the original Bitcoin. Bitcoin Cash came to fruition in August 2017 after a hard fork and a split in the Bitcoin blockchain. There are constant debates and many opinions about how best to cultivate cryptocurrency, and Bitcoin Cash is a direct result of the argument. In this guide, you’ll find out what exactly makes Bitcoin Cash special, who’s working with the currency, and where to get your hands on some. Bitcoin Cash stems from the scalability issues that face Bitcoin. The original blockchain has grown exponentially in recent times. This means that many more users and transactions are using the cryptocurrency, which is weighing down the network. The limited Bitcoin block size of 1 MB means that blocks are filling up more quickly than they can be mined. Transactions have, at times, become slow and expensive. Bitcoin Cash makes some distinct protocol changes, the main one being an 8 MB block size. This change allows for more data per block, meaning more transactions can be processed in each block mined. Many see this as a step forward in terms of how best to scale the network. Others remain adamant that it’s simply a short-term fix that doesn’t solve the problem, and there’s no implementation of ideas—such as Segwit, whose protocol is now active on the original Bitcoin blockchain—to help effectively break transactions down into smaller, more manageable pieces. Importantly, with a split in a blockchain, currency is duplicated. This means that the historical Bitcoin transaction data were copied, and anyone with Bitcoin funds was credited with the same amount of Bitcoin Cash. So does that mean free money? Yes, yes it does—especially when each Bitcoin Cash is valued at hundreds of dollars. Here’s our guide on how to claim your Bitcoin Cash if you owned Bitcoin before the split on August 1, 2017. Before you can buy Bitcoin Cash, you’ll need a Bitcoin Cash wallet to store it in. Many providers and platforms have been reluctant to embrace Bitcoin Cash. There could be many reasons for this. Some may hold on to ideals about how best to scale cryptocurrency; others may simply want to focus their efforts. Recently, many major wallet creators have been adopting Bitcoin Cash. While there may still be fewer exchange choices, you can find plenty of places to squirrel your funds away for now. Hardware wallets that support Bitcoin Cash include industry leaders Ledger and Trezor. Both provide functions for you to use Bitcoin Cash as you would any other cryptocurrency. After a slightly slow start, they’ve also introduced the ability to claim your funds if you already owned Bitcoin at the time of the blockchain split. There are a variety of software wallets you can use; you may even already be using one of these for your original Bitcoin. Exodus provides a seamless shapeshift service with its software so that you can move your currency at will. For example, you can morph between Bitcoin Cash and Ethereum Classic if you’re feeling particularly alternative. Jaxx supports multiple currencies, including Bitcoin Cash. The service runs on desktop and mobile devices, so you can keep your private key with you at all times. Some exchanges work with Bitcoin Cash, although you may not want to leave your funds in their wallets for extended periods of time. Storing funds with online companies can make for quick trading, but you tend to lose control of your private keys. This might be a security risk depending on what service you use. Coinfloor offers a decent wallet that allows you to trade on its UK exchange. It will keep your keys in cold storage offline while making your funds available to trade with on short notice. Bitcoin Cash exchanges are not as abundant as Bitcoin exchanges. However, there are still some heavyweight options to work with. eToro – Platforms like eToro don’t give you actual access to your coins and you can’t send coins from eToro to other people. The only thing that can be done with the platform is to buy and sell Bitcoin Cash for fiat currency (i.e. Dollars, Euros, etc.). Meaning this platform is good if you only want to speculate on the price. This method is only valid if you live outside of the US. Coinbase – The most reputable Bitcoin exchange around just added Bitcoin Cash support and buy / sell options (starting Dec 19th 2017). Coinbase allows you to get competitive rates if your country is supported by the broker. CEX.IO is also a nice option. Based in London, the company is a trusted, experienced name in the industry, having been around since 2013. 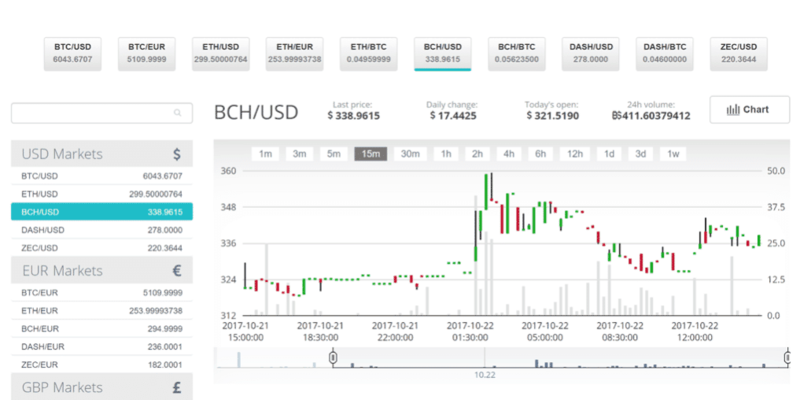 You can choose from a selection of currencies, including Bitcoin Cash (read our CEX.io review here). If you just want to get ahold of some currency, there’s a quick buy option via credit card. Be aware, though, that the credit card option is an expensive one. For low-fee trading, you can deposit via bank transfer and trade on the exchange for a 0.2% fee, and it will save you a small fortune on large buy and sell orders. The European-based company allows you to work in both euros and USD. You can even use margin-trading techniques on the platform to maximize (or minimize) your returns while also keeping an eye on the market depth. Coinfloor supports a Bitcoin Cash open exchange; it’s also London based, so it’s very helpful for UK traders. If you know what you’re doing when it comes to trading, Kraken has been functional with Bitcoin Cash ever since the cryptocurrency’s launch in August. 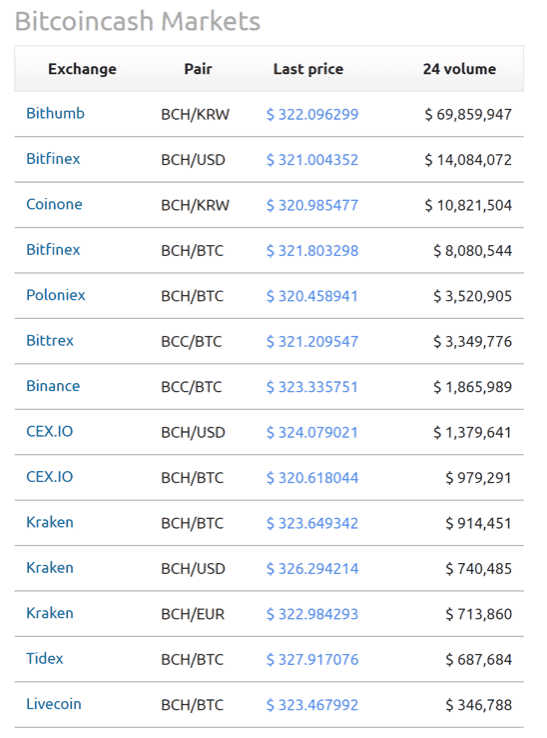 Other options include Bitfinex, Poloniex, HitBTC, and more (you can view all available exchanges on Bitcoin Cash’s website). As usual, we recommend that you never leave money on an exchange. Once you’ve finished buying your Bitcoin Cash, move it to your own self-hosted wallet (the one you have control over the private keys to). You can then follow the status of your transaction using a Bitcoin Cash block explorer. Once you receive three confirmations for your Bitcoin Cash, you can safely say you’ve completed the process. It’s apparent that Bitcoin Cash has still not gained full acceptance by large parts of the cryptocurrency community. It still sits firmly in second place to its older brother in terms of both price and availability. The future is unclear for Bitcoin as a whole. More splits and hard forks are a certainty, and Bitcoin Gold (yes, another Bitcoin) hasn’t enjoyed a large profile since it forked from Bitcoin in October 2017. Bitcoin Cash is staying clear of Segwit, whereas the original blockchain pushes on toward increasing the implementation of Segwit. Who will reign supreme? In the short term, no one—and we’re likely to see further turmoil as 2017 concludes. Bitcoin Cash might have the advantage of being the first major split that has garnered acceptance.